See the original article without a photo credit HERE. A dark satire about former Premier Campbell Newman and his anti-bikie laws - in which criminal gang members are forced to fight each other in pink jumpsuits - will debut in Melbourne next month. Bounty blends recent Queensland political history with Ancient Rome to create an absurd take on radicalisation, vice and moral panic in modern Australia, according to playwright Eric Gardiner. 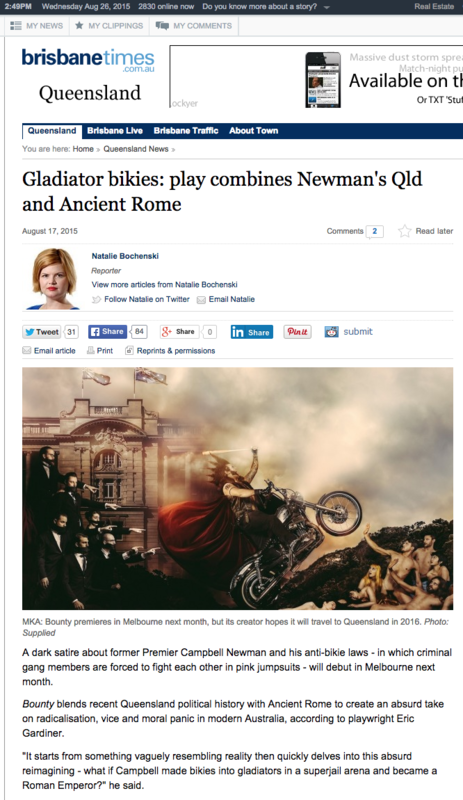 "It starts from something vaguely resembling reality then quickly delves into this absurd reimagining - what if Campbell made bikies into gladiators in a superjail arena and became a Roman Emperor?" he said.